I think this is the best knickknack ever! 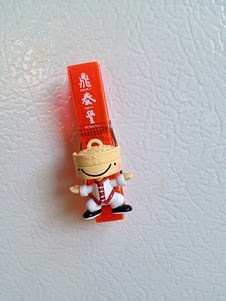 The boy has returned from his business trip, and before he collapsed from exhaustion, he gave me this dimsum head magnet from Din Tai Fung in either Hong Kong or Taiwan. While this still doesn't make up for having to walk Mingus for 10 days, it's a start. The New Year is creeping up, and since I detest all the listicles going around the web, I'll spare you any type of year end round up or any resolutions (which I never make since I believe in fixing things I want to change right away instead of once a year). 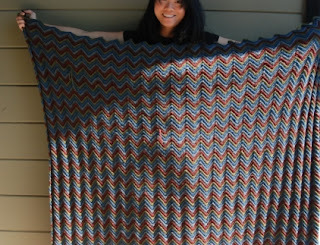 However, I do want to finish my neverending afghan. And soon! I have 2 more balls of yarn left, and so far I've crocheted 101 stripes. The picture above is old. Now, when I hold up the afghan, it covers my head, so that makes it just over 5-feet high. Dreary and cold weather, old episodes of Being Human, some episodes of Ice Road Truckers, season 1 of Portlandia (which is so, so Berkeley), Manhattans and martinis, and horrible congestion that is keeping my energy level diminished has made for record breaking crochet marathons. Funny, but I don't have anything on the needles. Everything I'm working on requires a hook. Happy New Year, blogosphere! See you on the other side. Whoa, that's a lot of stripes! 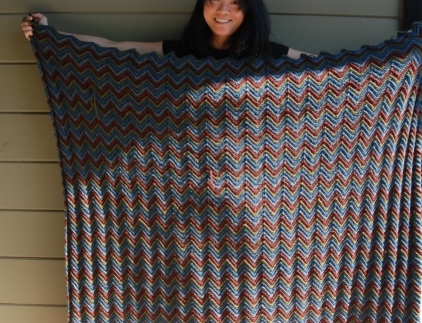 We have a couple of ancient ripple afghans here, one of which I made for DH before we were even engaged. That was long, long ago. I love your little steamerhead dude!